The AQUASPAVE construction method is a method for constructing asphalt-based water-retentive paving by filling the voids in an open graded asphalt mixture, which becomes the parent body, with a water-retentive grout (AQUASPAVE). On sunny days in summertime, a road surface temperature-lowering effect of a maximum of around 15℃ can be expected. Because the road surface temperature will be reduced, the paving surface radiant heat will be lessened, which will mitigate the uncomfortable heat felt by pedestrians and people living along the road or path. Even in the situation where sunny weather continues, the temperature-lowering effect can be adequately achieved by sprinkling water. Due to the road surface temperature limiting effect, the circulating resistance will be enhanced. In the situation where repairs are carried out using cutting, the generated materials can be recycled as aggregate. 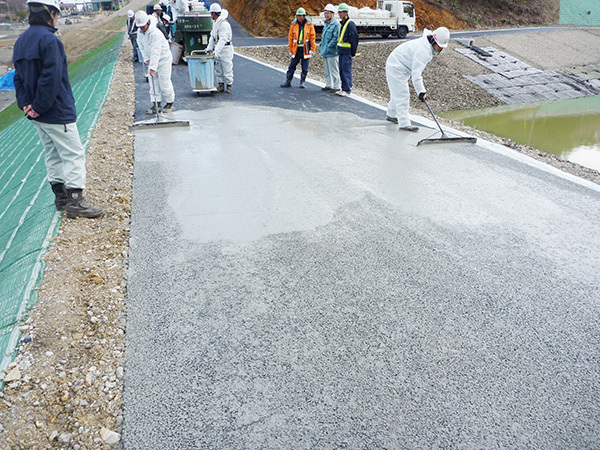 For roads AQUASPAVE 60 is used, while for walking paths AQUASPAVE 80 is used.